Meera has suddenly and unexpectedly left us to the other shore. As of her instructions and wishes her courses and trainings will continue and the spirit of her work will be kept alive by her longterm assistants to their best abilities and in the way she would have liked. Meera leaves with us a vast inheritage of paintings, DVDs, books and most of all will continue to be alive deep in our hearts and remain a continuous source of inspiration and love. Thank you, beloved Meera, for the gift of being who you are! MO., 22. JULI – 2. AUG. This training was designed for people who have a strong wish to work with people. 12 days Art Therapist and Painting training in Amalurra, in the heart of the Basque country Spain. This is the longest such training in Europe this year and an opportunity for total immersion in Primal Painting, Self Portrait and Nature Painting over two weeks. 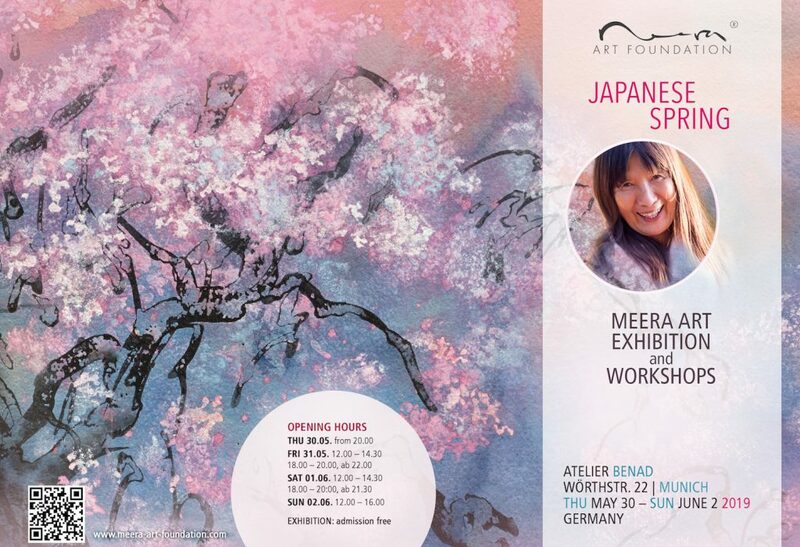 A chance to reconnect with the childlike innocence of the being through painting, meditation and group work. 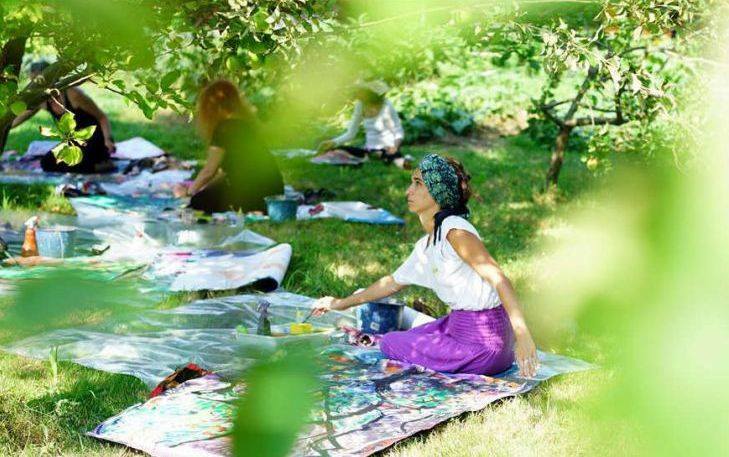 The first week gives us the space to reconnect with ourselves and our own creativity and in the second week we experience our inner and outer nature by painting outside in the beautiful orchard, woods and gardens of the Amalurra community. A unique chance to participate in a training event presented by facilitators and staff who worked with Meera over many years. PRIMAL PAINTING: During the first 3½ days we explore the psychology of creativity through dance, movement and exercises, designed to loosen and release our creativity blocks and reconnect us with our authentic expression. A chance to rediscover the joy of painting that every child discovers naturally when there is no goal or pressure to “make something”; simply painting for the joy of painting. 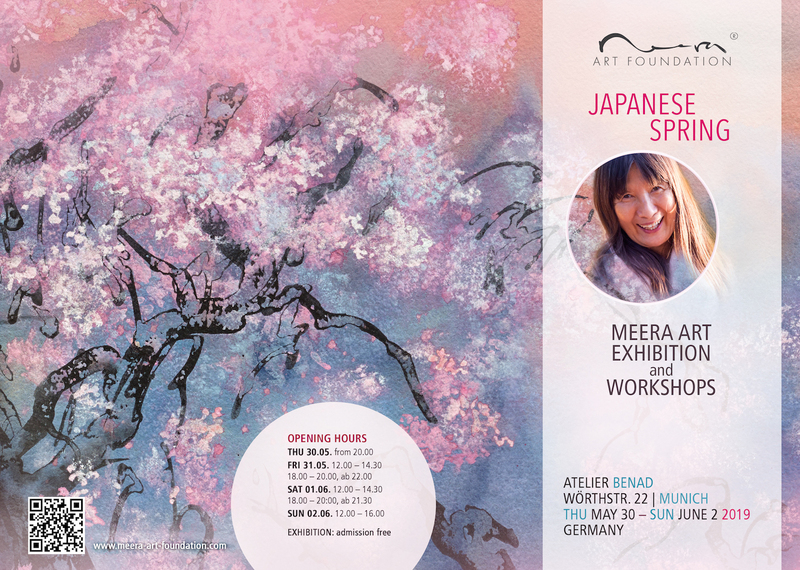 This training is the foundation of Meera’s work and was developed over 35 years. PORTRAIT & SELF PORTRAIT: The next 3½ days of Self Portrait and Portrait introduces us to one of the most difficult artistic subjects of all; the human face. This happens as a gentle unfolding which brings us into contact with the mystery of the human face and our own darkness. Over these days we make friends with our own image and all that it represents by looking into the mirror using special paints and paper we slowly uncover our own mystery and discover layers of self-acceptance while meeting ourselves in a unique way. NATURE PAINTING INTENSIVE: Painting outside in the natural beauty to be found around Amalurra in the river bed, woods and gardens gives us a taste of the silence of nature. We find our own expression as we paint among the trees and plants. Nature provides a mirror which lets us get closer to our inner and outer freedom. Group work is an essential part of the process which supports our growth together as we move as one energy from the group room outside into nature. All of the training takes place in an environment of meditation and playfulness. OSHO Dynamic meditation, Kundalini meditation and Evening Meeting are our constant companions during this painting and training experience. This year there will be 1½ free day’s between part 1 and part 2 which can be used to visit the Guggenheim Museum in Bilbao, or the replica of the Altamira Caves near Santillana del Mar or just to explore the mountain and wonderful nature around Amalurra. LOCATION: Amalurra, Artzentales approximately 45 minutes outside Bilbao in northern Spain. Osho Art Therapist Training provides the essential training for those who want to work with people through Art and Therapy. Many unique exercises are used in order to look into our patterns and tendencies, which help us to awaken our original expression. The entire process is accompanied by Osho’s active meditations including Dynamic and Kundalini. Creativity is simply our human nature, when this creative energy is present in our lives we feel an energy and enthusiasm that extends far beyond painting and into everything we do. It is the process of learning about oneself and an ongoing journey of finding an original expression in us. We dive deep into the process of primal painting, self portrait, nature painting, group dynamics, and open studio. We examine our inner motivation and the influence of our family of origin. During this time together we meditate, and grow together in an atmosphere of trust, sharing, playfulness and curiosity to allow us to expand into a greater awakening of our own being. The training takes place at Amalurra a community of 16 families established over two decades ago who are dedicated to a single vision of growing together in harmony with their environment. The new meditation hall of the community situated in the unspoiled natural landscape of northern Spain becomes our work studio; to paint, mediate and learn together. Later in part 2 we paint in nature in the woods, by the river and in the gardens of the community. The community of Amalurra is located close to the village of Artzentales and close to the towns of Zalla and Balmaseda. It is connected by bus and train links to the city of Bilbao and is a 40 minute drive from Bilbao International Airport and about 3 hours from San Sebastian Airport. Art is the longing of the individual to be bridged with the whole of life; to connect with and give expression to life itself. Thousands of years ago, in the caves of Altamira in Spain, long before any art schools were born, ancient tribes of hunters depicted bison and other animals with great sensitivity and accuracy. Their art was not the product of some carefully learned technique. It was a pure prayer of human expression. In a similar way, while reading this book, you may suddenly remember your own thirst to express, even if you are not a trained artist. This thirst can be remembered easily, because creative expression is nothing but your own life energy – it’s like invisible blood running through your body. The intelligence to create is hidden in us and can flow out like a spring bubbling from a snow-covered mountain top. It is endless, abundant and delightful. In our contemporary society, art is being treated more and more as a separate entity, something reserved for specialists, like any other profession. This is a pity, because painting not only is everyone’s birthright; it is one of the greatest tools for awakening one’s consciousness and awareness. Zen masters developed all kinds of strange devices to bring disciples to a place where the normal, thinking mind has nothing to grasp, no foothold on which to stand. In this gap, suddenly the disciple is directly confronted with existence, with life. This book invites you on a similar kind of journey, on a search to find yourself and the source of your original expression. Painting can be a mirror to look deeply into yourself. When you paint with awareness, whoever you are, whatever you are feeling in this moment, will find expression on the paper and be captured there, reflecting yourself back to you. All that you need to do is stay open and watch. In this way, through awareness of each moment, a revolution in consciousness is possible, because the mind has no space to get into old habits of commenting, judging, criticizing or instructing. Living each moment means giving space to intuition and spontaneity. Once you learn this secret, painting is sheer joy and playfulness. You are accepting the invitation of life energy to flow through you. My hope is that, by reading this book, you will get so turned on that you will also want to look inside yourself and discover how painting can open all the doors and windows of your creative intelligence.